September is fall, right? Sometimes it’s hard to remember when the temperatures are still hot and the trees seem to be taking their sweet time changing colors. Well I brought it indoors! The entire summer I was feeling kind of BLAH about projects and decorating…I was super burned out. I knew that I needed to get back into it–to help fuel some blog posts, yes, and also just to get my creative mojo going again. I wanted to decorate but was not ready for halloween yet. So naturally, some autumn decor was in order. And since I don’t officially have a fireplace, this is my mantle. So I set to work on creating my fall mantle. I pulled out all my stuff and realized I had like two things that qualify as ‘fall’ decor. I used to have a ton since I did a fall wedding back in the day, but I was sick of it one year and donated it all. So it was fun to start with a blank slate. 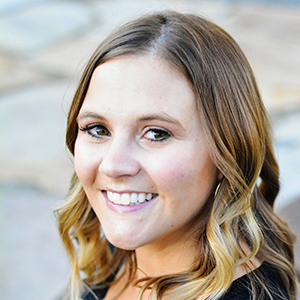 One of my favorite blogs for inspiration has lately been Ella Claire, the blog of an adorable girl I met this year at SNAP. I just love her classic country style, kind of like Dear Lillie. I kept these two blogs in mind as I planned out my fall decorations. I started with the wood backdrop. 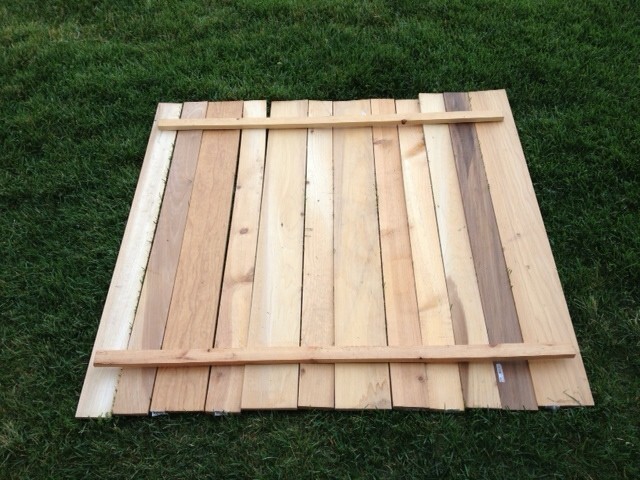 Like my Planked Wood Table, I am in love with the beauty of natural, raw wood right now. I was really torn since I am kind of dying to paint it, but I am resisting since after I paint it once it will never be the same. I built this backdrop and it was super, super easy. 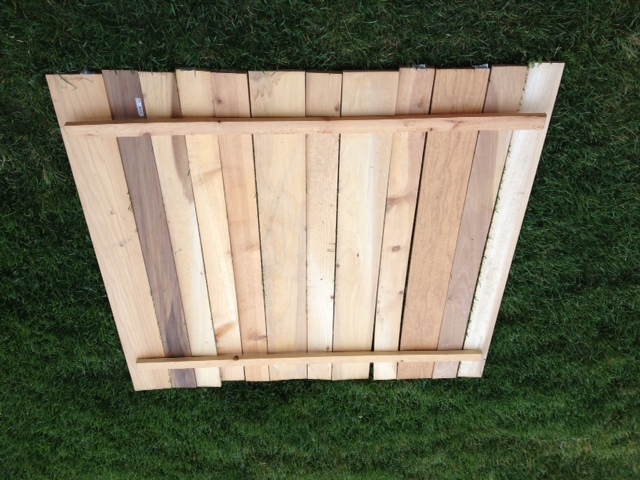 I had a bunch of Poplar planks the same length (but you could easily get them cut for you at the store) but I loved the variation in wood color…and it helped that it had been sitting outside for about 5 months (so it didn’t have that super new wood look.) I lined them all up and then braced them with some 1x2s which I simply nailed in using my handy dandy Ryobi nail gun (seriously one of my favorite tools–if you don’t have one, put it on your Christmas list!!) It didn’t have to be super sturdy since it’s just a backdrop, but now I have a beautiful backdrop for so many thing…pictures of my kids for one! I found a bunch of the other decor items at Home Goods and Tai Pan Trading. I made the chalkboard very simply by buying a large frame at a thrift store that had a hardboard picture in it. I flipped the picture over and painted the back with chalkboard paint (3-4 coats) and then staple-gunned it back into place. It is a great chalkboard now…I love it. I love all the images this mantle conjures up for me. As a kid, I used to have to spend time in the Church Welfare Orchards helping to harvest the apples. And my own parents have, and still do, several apple trees which they pick every year and sell and make amazing food with. 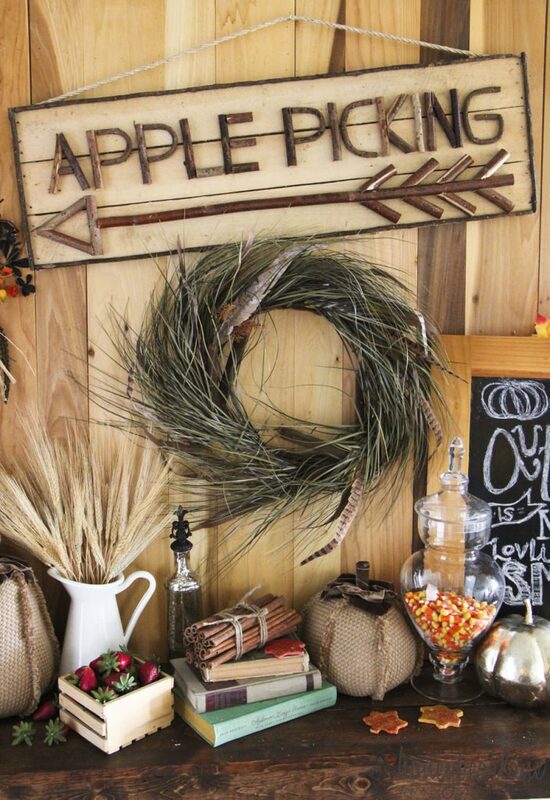 Apple pies, apple desserts, and fresh apples…all spell out Fall to me. I can’t even describe to you how happy I am that I live back in my home state of Utah where Autumn is absolutely gorgeous and perfect and everything I dream of every year. I throw some glittery spiders and fake web up. You’ve got me beat!! This looks great. Love it! Fall is my favorite time of year and I love the country vibe you captured. So so cute! I’m so glad you got your Decor -Mojo back. 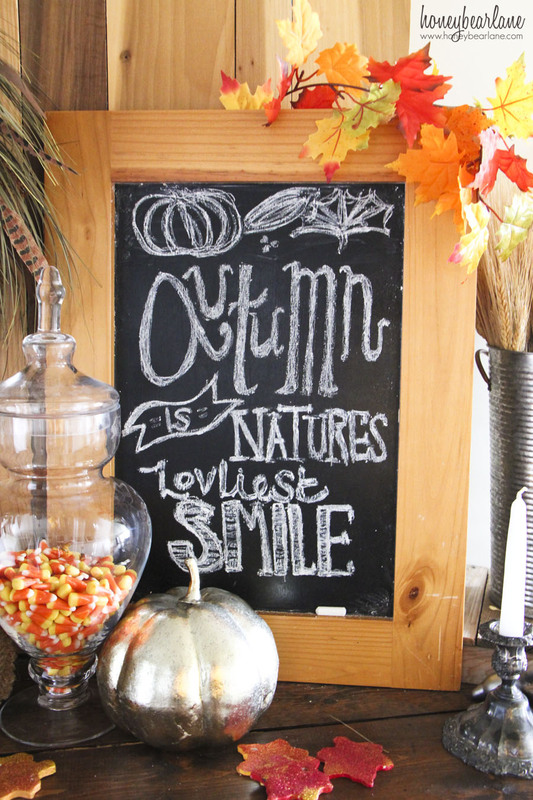 Your fall mantel is awesome! very inspiring. Love the grass and feathers wreath. 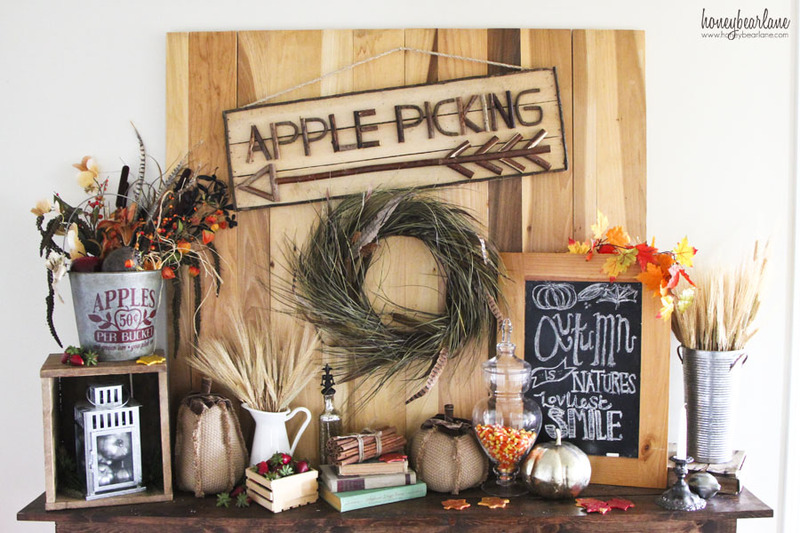 I love the wooden quoting on the chalkboard plus the wreath is amazing.I love fall decor and this is awesome project to welcome fall. Super cute! 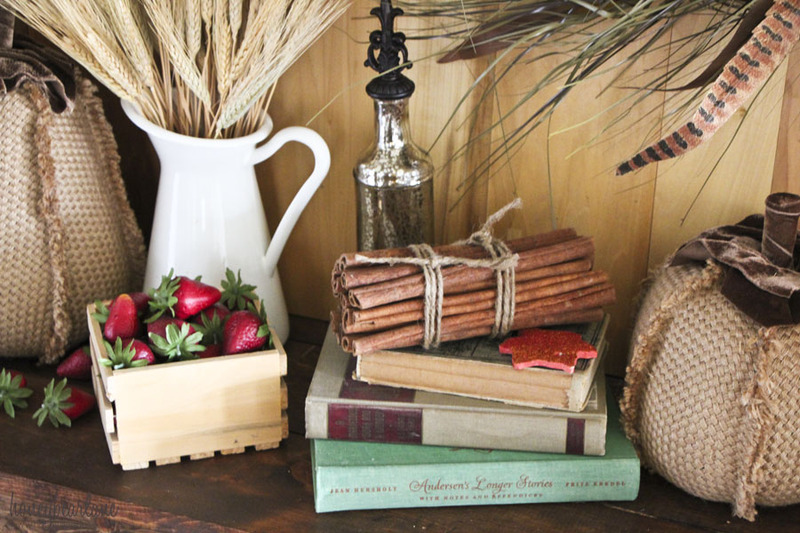 And I’m loving the cinnamon sticks in a bundle…cute idea!